I used to have my nails done. when we were cutting costs so that I wouldn't have to go back to work. Fancy nails vs leaving my child from 7am until 5pm was a no brainer for me. I still like to have pretty nails though. And when I stopped having them "done"
so my collection had got depleted and outdated. and I am well and truly inspired. but I do like a bit of coral in the summer. 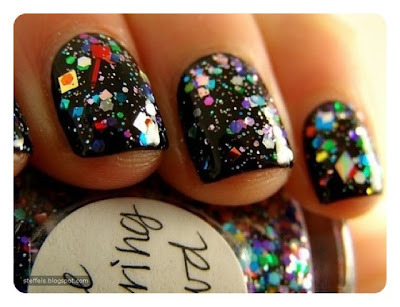 and I like the glitter on these ones too. ummm..... where can I get a bottle of this stuff? 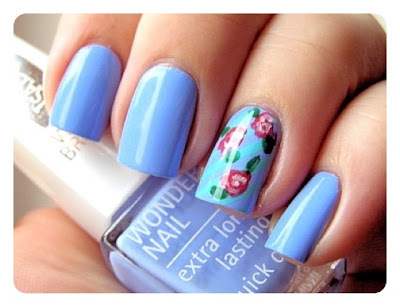 I would love to have one pretty flowery nail like this. made famous by Made in Chelsea. This is the current look I'm lusting after. I have got a real thing about white nail polish. which I have been trying to find ever since. Can't wait to see what's inspired you lot this week. Love that sparkle! If you ever find it then please let me know! 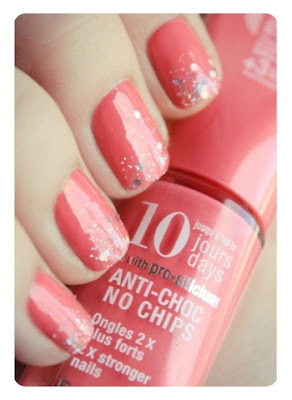 Not that I ever get round to painting my nails!